The Hand-L 2.0, now proudly made in the USA, is an innovative professional massage tool designed for trigger point work, for deep tissue massage, or for simple relaxation massage. The size and shape of Hand-L 2.0 are unchanged from the iconic original, first introduced in 1996. 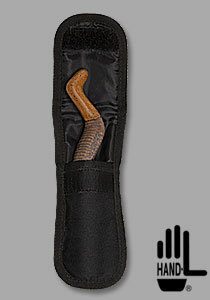 Each Hand-L comes with a padded belt loop holster carrying case.